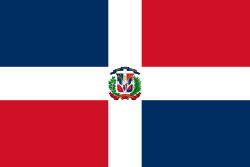 The Dominican Constitution says that the flag of the Dominican Republic has a white cross in the centre; the arms of the cross get to the sides of the flag and divides the flag into four rectangles —the left rectangles are blue (top) and red (bottom), and the right ones are red (top) and blue (bottom). The width of the white cross is half the height of one of the rectangles. The National Flag, like the state and war flags of other Latin American countries, has a small coat of arms in the centre of the white cross but there is not a coat of arms in the ensign (the flag used by commercial ships). The Dominican flag was created the first day of Independence (27 February 1844); it was created from the Haitian flag but with a white cross; that is, two blue rectangles on the top and two red rectangles on the bottom. The colors are from the French flag. That was the First National Flag. The first Dominican Constitution of 6 November 1844 did not say anything about the distribution of the rectangles but from the start the flag was represented with alternation of the colors (that is, blue and red on top and red and blue on bottom); this is the Second National Flag. Only the Constitution of 1908 is specific about the color distribution. Flag of Dominican Republic Facts for Kids. Kiddle Encyclopedia.